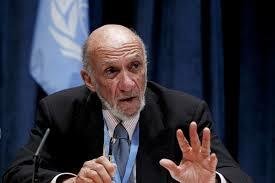 Richard Falk, UN special rapporteur on human rights in the Palestinian territories, said that Palestinian rights are being violated by Israel’s prolonged occupation of Palestinian territory and ethnic cleansing of East Jerusalem. In East Jerusalem, the « revocation of residency permits » and « forced evictions of Palestinian families, » as well as targeted demolition of Palestinian homes, amounts to a « gradual and bureaucratic process of ethnic cleansing, » Falk writes. Israel’s policies in the West Bank and Gaza Strip appear to amount to apartheid due to its systematic oppression of the Palestinian people and de facto expropriation of their land, Falk said in his final report to the UN Human Rights Council after serving six years in the independent post. Falk will present his report next month to the UN Human Rights Council as its special rapporteur on the Palestinian territories, demands that the world court examine whether Israel is guilty of the international crimes of apartheid and ethnic cleansing and urges the UN to investigate corporations that profit from unlawful Israeli activities. In his report UN special rapporteur recommends that UN member states should consider imposing a ban on imports of produce from Israeli settlements.